Shall we talk food? I thought so. My Universal Studios trip was brief and not particularly food-filled, but I made time to try some things. Lunch on day one was of course accomplished at The Leaky Cauldron in Diagon Alley. The offerings are extremely British and rather heavy, but I found a good option in The Ploughman's Lunch. It's advertised as for two but they can split the portion and sell it for one if you ask. The Ploughman's Lunch for One comes with half a Scotch egg, half a roasted tomato, salad, bread, cheese, and some random jelly stuff which sucked so we'll ignore it. This was... okay. The bread was not toasted and the Scotch egg was lukewarm. The tomato and salad were fine. The cheese was pretty good but I would've liked it to be separated from the dressed salad; it had developed some moisture. But cheese and bread are never a bad plan and from a nutritional standpoint this is reasonably sound. I wouldn't steer anyone away from ordering this one, but don't go in expecting anything special. Butterbeer was also to be had, because duh. I have had it before it both the regular soda and frozen versions. Almost everyone prefers the frozen version, but not me - CARBONATION IS MY GOD. HAIL TO THEE, SODASTREAM! ... Anyway. Butterbeer is basically cream soda if you replace the cream with a bit more of a butterscotch thing and add some rather amazing toasty vanilla foam to the top. Also, when unfrozen, bubbles. BUBBLES! 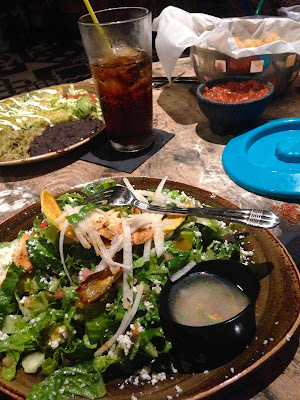 Dinner that day was at CityWalk's Antojitos (I wanted to go to the place that sold sushi AND burgers but was overruled). I had a large and tasty salad but it wasn't anything to write home about. In fact, I only really mention this mini-review to say that Antojitos is a standard Mexican restaurant and if you want to be wowed I'd say pass. That being said, I didn't have any margaritas and anything - who knows, they could be astounding. Try it and report back, soldier. I did finally get my sushi! I ate twice at the sushi place on the second level of CityWalk - Sushi Fusion according to the receipt, but the sign just says "Sushi." Apologies for the lack of photos; don't know how I spaced on that one. I tried the rainbow and dragon rolls along with avocado rolls. To be honest, the rainbow roll was not the best - serviceable, but the fish topping was just okay; disappointing when you expect the salmon and tuna to be the star. The dragon roll (eel) was better but nothing memorable. 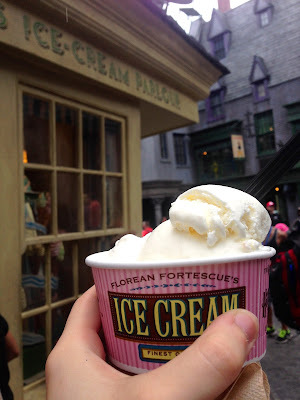 And now for the real star of the show - Florean Fortescue's Ice Cream Parlour, the new place in Diagon Alley. I went twice for a grand total of four flavors. I'm not gonna lie - flavor selection was tough. They have a million interesting options - strawberry and peanut butter, how did I leave you behind?! But for my first round I settled on what I found to be a logical combination: Earl Grey & Lavender and Clotted Cream. The Earl Grey is nice - sort of a vanilla base with the tea flavor mixed in. I don't remember a strong lavender element but then I couldn't describe with certainty what that's like so who knows. If you're into tea, try it. If you're not, don't. The clotted cream though. OH MAN, THE CLOTTED CREAM. It's like... it's like cheesecake ice cream, kind of, only BETTER. It's like when you have afternoon tea at the Grand Floridian and there's Devonshire cream and you spread it on a scone and it's awesome only instead of Devonshire cream it's now ICE CREAM. (No scone, though; hey, Florean, can we get on that?) Highly recommended if you're into tangy sweet almost-cheesy dairy goodness. And that's it! Thing I Am Bummed To Have Missed: breakfast in the Harry Potter places. Oh well. Just have to go back!